Aside from good acting and plot, we all know that music can make or break a show. Unappealing tracks can destroy an otherwise decent drama, while lovely, mood-appropriate pieces can make even the most dull of scenes fun or heartbreaking. I realized while compiling this that I've watched a scary number of dramas :). Originally I had all of my drama favorites in here, but as it turned out far longer than expected, I'm splitting into separate posts by country, starting with Korea. Unlike with Taiwan/Japan, Korea has differed in that while I've adored many of their oldie dramas, I've only more recently started getting into the music. This is a fairly exhaustive list of drama songs that I loved both while watching and long afterwards. Ranking is roughly in order of how much I like the songs (although I love all of them). Unfortunately blogger doesn't allow embedded music yet, so I've put up the youtube vids, plus some download links where applicable. Wonderful drama, strong acting, and great music? No wonder I love Prosecutor Princess so much. This song kind of makes you want to cry, both from the lyrics and the tone. But it tied so perfectly with the story, and I suspect is a reason why the drama underwent a title change to include Princess. I actually vividly recall all of the songs played in the series, but this is the only one I still listen to. 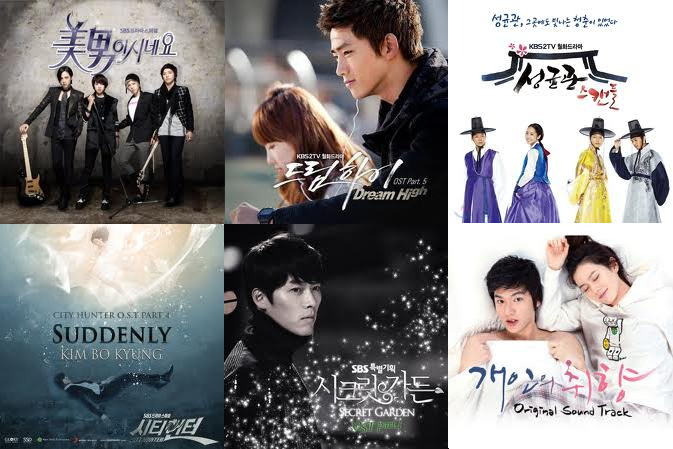 And even now, it remains my top drama Korean OST track. So the drama went down the drain around the time when they replaced this song with that depressing lady-ballad one for all the moody scenes. Which I understand, since they probably feared it would be overplayed. But still a stupid move, because instead of Yesung's awesome vocals we were stuck with some shrill lady for the next 16 episodes. I recall this only playing once in the whole series, right at the epic awesome sweet conclusion, but it was enough to hook me. Hard to find a better song to put you in a good mood. I had the original, the remix and the instrumental versions on repeat for a month. And I could still listen to them for just about forever. They edged up an otherwise moderate quality drama significantly, making it extra intense and enlivening. It's one of those songs that never fails to take me back to that summer when I first saw the series. CH had some awesome songs overall, which is probably a large part of why I loved it so much despite being extremely disappointed by the final pairing (Yes, I furiously shipped Kang Ji Hwan and Eunjung). This one was sorely underused in the actual drama (I think they only played the instrumental version of it once), but it's another addicting, fun to repeat piece, both the vocal and instrumental versions (fun study music too!). This is seriously one of the reasons why that make-out scene was so squeal-worthy. Slightly melancholy, but super catchy and fitting. I really wish the drama had lived up to its full potential, but at least I'm reminded of the good parts when I hear this. City Hunter's vocal tracks had a bad tendency of blasting on right in the middle of a cool instrumental at the end of each episode. While for most of the songs that became annoying (that's right, "It's Alright"), for Suddenly it was ok. Because who wouldn't love this? Epic and sweeping. I'm not big on operatic pieces, but this one is the exception. I didn't like it initially, but later loved every time it came on. Helps that the drama ended up being so magnificent. SKKS couldn't have been as addicting as it was without this song happily closing all the early episodes. I like it much better than the second song they chose to end the later episodes with, which was fine but a bit too depressing and ballad-y. Happy drama should be with cheerful music, right? Every time I think of the show I think of this song. Which may not be good, since the show wasn't my thing, but the song is catchy and made me want to like the drama. Pretty much all the songs on the soundtrack are great. Makes sense, since this was about an idol band. But I'd say even so the music was unexpectedly good, e.g., better than I Am Legend's soundtrack by a long shot. Jang Geun Seuk has such a beautiful voice and incredible acting range, and every time I hear this track I think of that heartbreaking scene with him crying against a wall after confronting his mom. I think overplaying songs actually makes me like them more. Is that counterintuitive? This was another one of those tracks that didn't do anything for me for most of the series, but suddenly clicked at the end (it is the closing piece, after all). I feel like it actually elevated my memory of an otherwise very poorly executed series. Ok, this one definitely overplayed (evidenced by the existence of a second version - the boring, slow acoustic one). But I didn't get sick of it, even though it usually started when my least favorite character, the annoyingly ever-present Ji Hoo, came on screen. It's catchy and broody enough to get a thumbs up from me even now. While I couldn't get into the drama, I LOVE the OST. It's rare in that it's almost entirely instrumental, and the pieces are suitably epic and sweeping. It raised each scene's emotions just a notch higher, and was one of the things that kept me glued to the screen despite not connecting with the story. This piece is my personal favorite of the soundtrack. Forget the vocals, which despite being good were nothing compared to this. Pair this with Ji Hyun Woo's incredible smile, and you have the perfect heartwarming scene. This is the show that made me a fan of Jung Gyu Woon, and of course starred Kim So Yeon after her Prosecutor turn. It's unfortunately a very forgettable drama, but was a fresh breeze to watch. The song, cheery and light, captures that. Next up: Taiwan / China!